Miami Lakes Movers – Moving can be extremely stressful. A good mover can alleviate that stress. 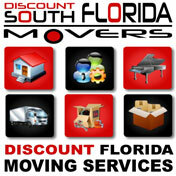 Discount South Florida Movers has been helping people move throughout Florida for decades. Our team of experts can assist you with your moving needs in any area. We guarantee you will be satisfied with your move. Our rates can’t be beat either. There are many different parts to a move from packing to the final transport. Discount South Florida Movers can do it all. We handle both personal residences and offices. If you need your move to be scheduled on nights or weekends we will do that for you free of charge. Let our licensed and insured movers help you. Miami Lakes is a mid-sized town located in the North West corner of Miami-Dade County. Although the development of the town began in 1962, the town wasn’t incorporated until 2003. One of the most famous landmarks is their indoor Veteran’s Memorial that includes a 50 foot mural featuring scenes from military history. When the town was first being developed the designers created a Master Plan that they have been following for the last 50 years. The design of the town also differs from a lot of the surrounding towns. It was designed in the New Urbanism style that was meant to keep shopping centers and residential areas within walking distance of each other. Discount South Florida and Miami Lakes movers provide low rates on residential, commercial, piano and long distance moving.